The Carolinas HealthCare System is pretty average in getting patients to pay their out-of-pocket costs. The 40-hospital system based in Charlotte, N.C., collects 30% to 40% of the total bill that patients have to shoulder before their high-deductible insurance kicks in or after their insurance pays its share. "It's an ever-increasing problem," said Chris Johnson, vice president of revenue cycle management at Carolinas HealthCare. More and more, health systems such as Carolinas HealthCare and Gwinnett Health System in Lawrenceville, Ga., are relying on revenue-cycle tools to get good cost estimates to patients so specially trained staff can walk patients through payment options. Ideally, providers should collect as much of a patient's out-of-pocket cost as possible before delivering care, hospital executives say. Good cost-estimation tools allow hospitals to share payment information with patients upfront and increase the likelihood of getting paid. It's not an easy battle, though. Carolinas HealthCare collects just 3% of all its patient revenue upfront, but not for lack of trying, Johnson said. The health system has a staff of more than 30 people who reach out to all patients scheduled for inpatient care and high-cost outpatient care, such as surgeries, Johnson said. Those patients are encouraged to pay any out-of-pocket responsibilities over the phone when they register and receive pre-hospital instructions, he said. "We ask how they plan to pay for service," Johnson said. When registering patients for treatment, authorizing their insurance if they have it, estimating their out-of-pocket costs and billing them, hospitals increasingly are turning to software as a vital tool in the effort to get paid. Carolinas HealthCare uses software by revenue-cycle vendor Recondo Technology to accurately estimate what the patient will owe out-of-pocket given his or her insurance and deductible status. The system is not insensitive to patients' looming deductibles, which often run $3,000 or more, Johnson said. But hospitals still face the reality that their bills must be paid. Failing to collect patients' out-of-pocket share costs hospitals nationwide billions of dollars, and the situation promises to get worse, said Eric Boggs, a principal at Crowe Horwath. According to the consulting firm, providers collect on average just 30% to 40% of all out-of-pocket medical costs incurred by patients. Out-of-pocket costs represent 11% of total billable inpatient costs and a much larger 27% of outpatient costs, Boggs said. In the short term, that's a double whammy for patients as they face higher deductibles and the industry's shift to promoting outpatient care. The delivery change will save healthcare systems money, he said. But for now, unpaid bills from patients with insurance are "being amplified by the move to outpatient" care, Boggs said. ZirMed, a revenue-cycle management and data analytics company that is merging with Navicure, is slightly more optimistic, finding that hospitals get paid about half what patients owe out-of-pocket, according to CEO Tom Butts. In 2016, for the first time, more than half of all workers (51%) with single coverage faced a deductible of at least $1,000, according to the Kaiser Family Foundation/Health Research & Educational Trust. And 29% of workers were in high-deductible plans compared with 20% two years earlier. For the average family buying insurance on marketplace exchanges, the deductible this year is a whopping $8,232, according to a new by West Corp., a communication and network infrastructure company. 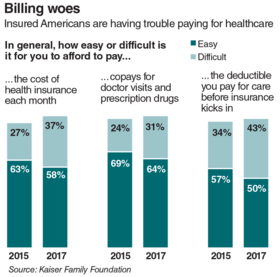 West's research found that 56% of U.S. residents delay paying their medical bills, in large part due to high insurance deductibles and confusion regarding insurance coverage. At the same time, hospitals need to delicately balance protecting their bottom lines and watching out for patient concerns. Consumer advocacy groups over the past few years have ramped up criticism of healthcare bill-collection practices. In a study last April, the U.S. Public Interest Research Group and the Frontier Group claimed that nearly 70% of people complaining to the federal government about medical debt collectors contended they didn't actually owe any money. 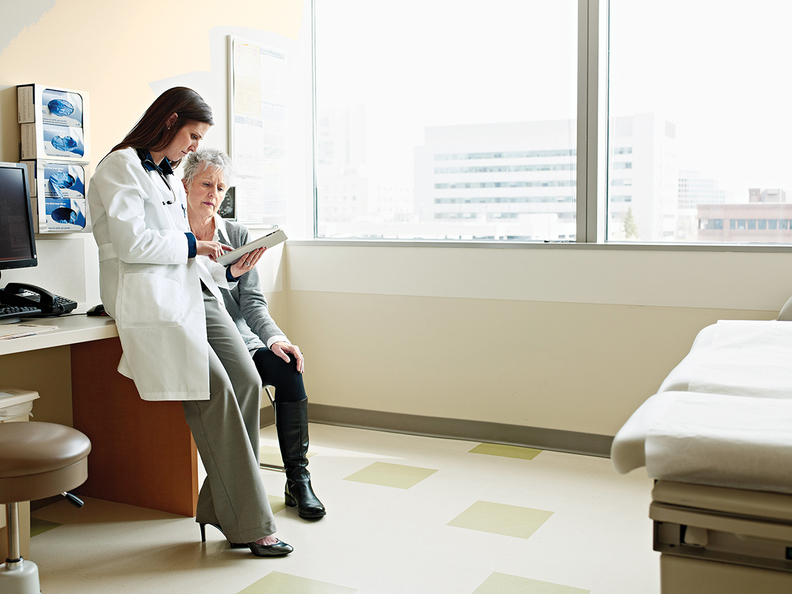 A lack of communication with patients is contributing to the problem. The West survey found that 36% of providers never discuss a patient's ability to pay prior to delivering services and just 23% make it a habit to always discuss each patient's ability to afford the care. Even fewer, 15%, actually call, text or email patients with the information to prepare them for their required payment. 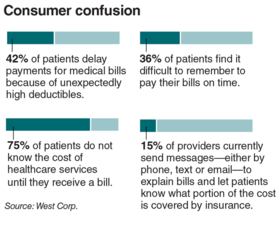 "By sending patients pre-billing messages, providers can ensure patients know when to expect a bill, what portion of the bill is covered by insurance and the amount the patient is responsible for paying out of pocket," according to the study. Gwinnett, a two-hospital system that has agreed to merge with giant Northside Hospital in Atlanta, finds that most patients today don't meet their deductibles until about June, so they are on the hook for payments, said Cathy Dougherty, Gwinnett vice president of revenue cycle. The health system has five financial advocates who call non-emergency hospital patients facing high-cost procedures and diagnostics, such as MRIs, CT scans and surgeries, Dougherty said. Gwinnett uses RelayHealth's Clearance estimator tool to accurately assess each patient's out-of-pocket costs and ability to pay given the person's financial history. While no one likes high out-of-pocket costs, unexpected bills are even less popular. "We don't want patients to be surprised," Dougherty said. Gwinnett offers payment financing options with a 40% discount on their bills if they pay at the point of service and an interest-free option with a 10% discount if they pay in full within a year. A rule of thumb is that patients will fall in four categories for timeliness of payment, Dougherty said. One group pays right away, one group needs a little more time, the next requires a call or two, and then there are the people who don't intend to pay. Gwinnett uses a vendor for outreach to the final group; the vendor represents itself as the hospital in trying to collect payments, Dougherty said. The revenue cycle software identifies the hard cases using previous experiences with the hospital and other financial indicators. The vendor, which Dougherty stressed is not a collection agency, offers the same kinds of financial assistance and payment plans to get payments made. Dougherty points to practical and personal reasons why Gwinnett is intense about sharing out-of-pocket cost information with patients. Her practical side knows that patients who are told upfront, before procedures, what they will owe are more likely to pay their bills and have a better customer experience. From a personal standpoint, Lawrenceville, Ga., is a town of about 31,000 people, and she doesn't want to run into someone who feels blindsided about the costs of care.